Sarah B. is upbeat, bubbly, kind, open, and incredibly fun. She seems to surround herself with friends and family nonstop and has a contagious smile that makes it hard to resist a good mood when in her presence. In 2009, Sarah was at the height of her life and career, with a husband, two thriving young boys, and a new job as a director of a local child care center, all the while remaining active in her community in Montgomery County, PA. At the start of the year, she began feeling some weaknesses, which led her to a myriad of tests and doctors near and far from home. Over the course of six months, Sarah spent a lot of time going from appointment to appointment only to finally discover a devastating diagnosis of ALS. Not long after she was diagnosed with ALS, Sarah was diagnosed with another condition: pregnancy! Yes, Sarah was pregnant with their third child. While her doctors and nurses were unsure what to expect from being pregnant and having ALS at the same time, Sarah enjoyed a healthy pregnancy and delivered a beautiful baby girl. 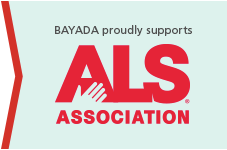 Although the disease was progressing relatively slowly, Sarah already realized how difficult and overwhelming it was to work and care for a young and active family while living with ALS. Sarah soon recognized her need for assistance in the form of home health care and the benefits that an in-home aide could provide. After working briefly with another provider, Sarah made the switch to BAYADA in September 2013. She mostly needs assistance doing day-to-day tasks like laundry, grocery shopping, and cleaning, along with range of motion exercises, so that she can focus on conserving her energy to spend time with her family. 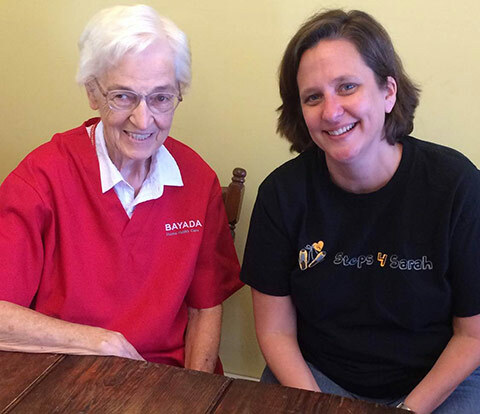 When Maxine Vogan became Sarah’s BAYADA Home Health Aide in December 2013, they also became instant friends. It didn’t take Sarah long to realize just how important this in-home care was to her and her family. 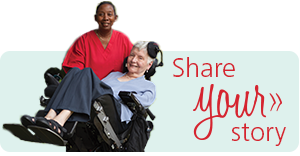 In addition to Maxine’s very kind and sweet nature, she is a great aide and can assist Sarah with everything from household tasks to performing the range of motion exercises—something that Sarah doesn’t love doing, but very much needs. For almost two years now, Maxine has provided Sarah with exceptional care and assistance in her home, allowing Sarah the opportunity to focus her precious time on enjoying activities and just being with her children and family. Sarah and her family are grateful for their local BAYADA office and Maxine’s presence in their home, allowing them all to feel less overwhelmed by the constant hurdles they face because of her disease.